When it comes to a circus show, how do you qualify it to be a die-die must-see performance? Is it by the number of death-defying acts, whereby if the performers miss their mark by a mere millimetre, they could actually die? Or is it by the number of contortionist and aerial acts, whereby bodies are bent at mind-blowing angles and flipping higher with every mid-air twist? Or is it by the number of times the show made you laugh uncontrollably, to the verge of tears? As the monkies and I found out (to our delight), KOOZA delivers ALL of the above... and more. Created by director David Shiner in 2007, Kooza tells the dreamy narrative of the child-like Innocent captivated by a colourful Trickster, who springs out of a box and introduces the Innocent to a bunch of amazing stuff. And my oh my, what a whole lot of amazing stuff was packed into the 2-hour show! There are ten acrobatic acts, all of which inspire nothing but awe. The opening act – a lively sequence of acrobatics sets the tone before a trio of hyper-flexible Mongolian contortionists sculpt and merge the human form into shapes that I never imagined to be possible. Then came the double decker high-wire act which had wirewalkers perform jumps on a single wire strung high up between 2 poles. Not thrilling enough? The 'wow' factor was upped a few notches when they cycled across the wire! But the biggest shrieks and gasps were reserved for the double wheel of death performance. Two performers rotate the giant wheel just by running - much like hamsters - but without any safety wires. The spinning of the wheel gets more and more high paced and there are genuine screams of fright from the audience as the performers jump up high into the air with the wheel spinning before landing back onto the wheel. I lost count the number of times I had retrieved my pounding heart from my mouth. As for the clowning, it is safe to say that everyone will be roaring with laughter. Kids will be particularly tickled every time the clowns appear - there is a peeing dog, confetti sprays, being hit on the head with a plastic steak and popcorn sloshed over the audience's heads. After all, the director began his Cirque Du Soleil roots as a clown and the humour clearly works. And amid all the acrobatics and clowning, there is a genuine story behind KOOZA to be followed AND a lesson to be learnt. The Innocent is seen trying to get his kite to fly at the start of the show but to no avail. After the appearance of the Trickster who shows him all of the amazing acts, he manages to get his kite flying by the end of the show. And this, perhaps was the biggest takeaway for the monkies after the show - that the possibilities are endless if we put our body, mind and soul to it. Who could have imagined that the human bodies could be pushed to the limits that we had seen in the show? I loved how the ending provided food for thought for the kids. 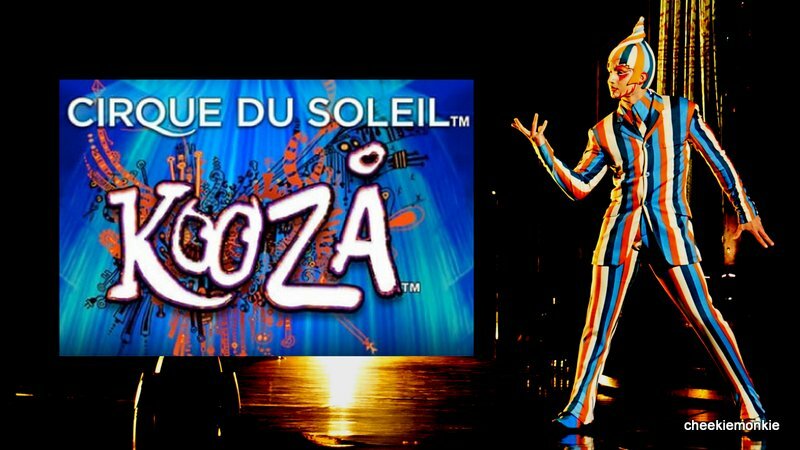 KOOZA is a return to a more traditional circus show. There is no hi-tech light projection or pyrotechnics; just good old acrobatic acts. And everything about it is BREATHTAKING. The monkies loved every single act and by the time the two hours were up, they were still wishing for more. Just listen to the thunderous applause at the end of the show! This is as perfect as a Cirque du Soleil show you’re ever going to see and frankly, this is the best one I have ever seen. Simply put, this is one Cirque that you cannot miss. Congratulations to New Siaw Hoon ! You have won 4 tickets to catch KOOZA on 27th July (Thursday) 2017 for the 8pm show! Please email me at kelvin@cheekiemonkie.net for prize collection details. Thanks! Thanks to Sliding doors Entertainment, I have one set of FOUR tickets* to KOOZA to give away! *NOTE: The tickets are strictly valid for 27th July (Thursday), 8pm show. Giveaway ends on 23 July 2017, 2359 hours. We would love to go! I have liked the Sliding Doors Entertainment FB page. Love it to max. My kids love it. Hi... my 3 kids have been asking me if they can watch this! Not cheap to get tickets for all. I believe you understand. Really hope to get the tickets. Thabks alot for this chance. Bless you and your family!! :) oh yes. I had liked n followed Sliding Doors Entertainment FB page! Would like to win this for my family . and it will be really a great experience . Let our EYEs freeze on the thrill performance. I hope to win the tickets to watch Kooza! Hope to win the tickets for my family. My kids will be thrilled! Hope to win..i wish to give my child a memorable birthday surprise! Liked the page way before this post! But I really wanna win this please! It'll be a really great gift for me, my niece and nephew! I hardly get the chance to bring them out and this will be a great opportunity! Please cheekiemonkie! Sincerely hope to be chosen to bring the little ones to this mind blowing circus performance. They will definitely enjoy it and this will be the Most Memorable Performance for them. Thank you for the chance. Cirque du soleil always bring amazing shows, would really love to win the tickets to bring the family along, esp for my mum who has never been to any of their shows before. Always contemplated if it's worth the dollar coz it's sooo expensive to buy for my family of 5! Am now convinced after reading your reviews!! Pls let me win....our family's first ever Cirque du Soleil show! Perfect birthday gift for my girl who turn 12 age in aug . Hope this will encourage her before the PsLe that life skills is as equally important and no matter what you choose to do in future , put your whole heart and soul into it just like the performers in Kooza !!! Liked and posted on Facebook . CDS Kooza is the event of the year!! Would love to win this for my family. Thanks. Done. Hope to watch this with my kids. I hope to win the tickets to bring my parents to this show. I would like to bring my family to catch this world class performance,especially my dad who was not with us at the last Cirque de Soleil show. My boys are doing artistic gymnastics and already many of their friends are privileged to watch the performance... I hope to win this as I will not be able to afford otherwise to expose them to such opportunity. Thank you for the chance. It looks too good to miss this show. I hope to win to bring the family for a fun day out. Hope to bring my family to watch this amazing show! Hope to win the tickets for my wife who had been bugging me to bring her to the performance. I would like to win the tickets to bring kids to the show. Hope to win and bring my 2 children and husband to watch the amazing and thrilling Kooza ! Hope to win it for my 15th wedding anniversary as a surprise gift this year. I'd love to bring my hubby, my Sister Evelyn & BIL Stanley Ho to watch KOOZA ! Hope to win this fabulous giveaway. I have heard many positive reviews on this performance but the tickets are more than U can afford for the family. Hope to be the lucky winner. Thanks Sliding Doors Entertainment and Cheekiemonkies for organising this contest! Thrilled to see this giveaway! We are a family of four and have never seen a circus show. Would very much appreciate the chance to watch Kooza as a family. Moreover, it's pretty near my girl's birthday (3 Aug). Am sure it will be a memorable time for the family. Hope to win the tickets. Hope to be the lucky winner to win the tickets and bring my 2 kids and my mum to watch the fantastic acrobatics performance. Hope to win this for my family!! 1. LIKE Sliding Doors Entertainment's Facebook page HERE. : Done! 2. Leave your comment either in the corresponding Facebook post HERE or in this blog post after you have done so. : Done! Hope to win for my family so I can bring my two daughters there. �� Thank you Cheekiemonkies. Hope to win for my family our first amazing show and stunning costumes thrills from start to the end of the show. Hope to experience the magic of Kooza. Cirque Su Soleil is absolutely amazing. I'd love to bring my family!